Have you every heard disrespectful or noninclusive language on the playground? This is a common challenge, but it is also an opportunity. You can create safe, inclusive spaces by making high fives and positive language the norm at recess. Adults and student leaders can model these tools and embed them in games. 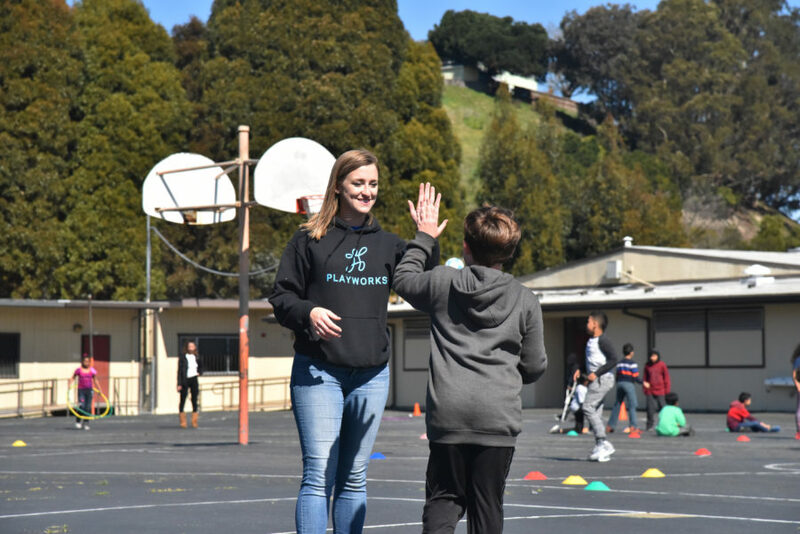 For example, when a student cycles out of a game of four square, each student waiting in the recycle line can give that student a high five and say, “Good job, nice try.” In doing so, we build community among students and create positive habits. We also replace the phrase “You’re out!” which often leads to conflict. Positive communication engages students and fosters healthy behaviors both in and out of the classroom. 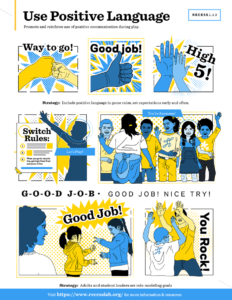 When students use positive language and high fives starting in first grade, these tools become part of their normal vocabulary throughout their entire elementary school experience. But what steps can we take to get started? The strategy for making positive communication the norm is not linear. It involves continuously reinforcing behaviors with different groups throughout the year. Make student leaders role models for positive behavior. Meet with them to set goals, such as giving 5 high fives each day. Open games or recess by demonstrating how students can communicate positively when a fellow student gets ‘out’ of a game. Close games or recess by affirming students who were using positive language or giving high fives. Adults can join games at recess and model positive communication by saying, “Good job, nice try,” or giving high fives when students get ‘out’ of a game. Have the group of students waiting to play repeat a positive cheer when a player gets out of the game. Make a rule that when a student gets ‘out’ of a game like four square: they get a high five from everyone waiting in the recycle line before the next player cycles into the game. Click on the image below to download. Print out this poster and get started! We’d like to hear more about you and your school. So to get access to our full library of resources, just enter your email address. We’ll use this information to send you ideas and recommendations for improving your recess. But don’t worry – we’ll never share or sell your personal info.